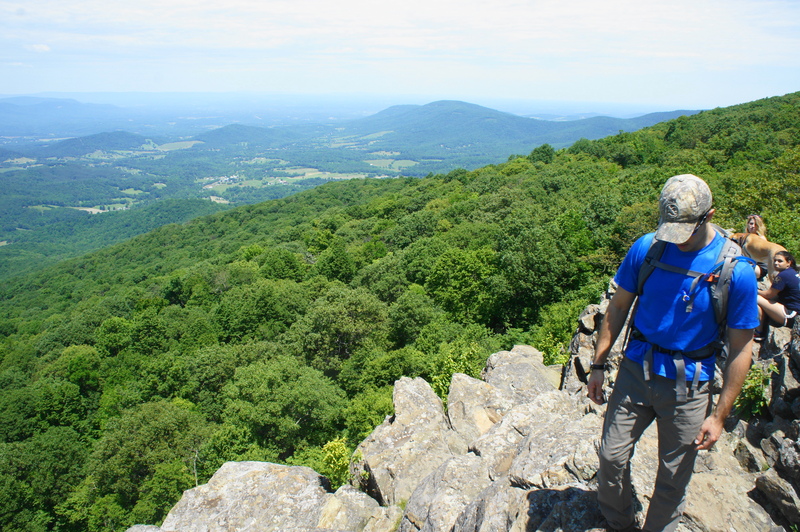 Mount Marshall—named for John Marshall, the famous 19th century Chief Justice of the Supreme Court—actually comprises two distinct peaks in the North District of Virginia’s Shenandoah National Park. North and South Marshall, as they are known, sport some of the best panoramic views in the park and, as an added bonus, are relatively easy to access from Skyline Drive. While many cover the two peaks in a much shorter out-and-back, ambitious hikers can turn the trip into a relatively easy but lengthy 13.5-mile circuit. This option follows the Appalachian Trail south, then swings around and traverses the entire length of the Bluff Trail on the return to the start. 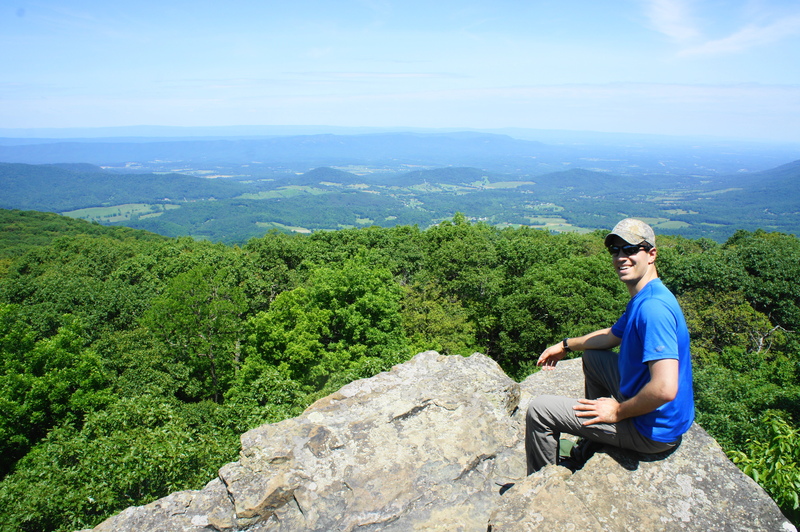 If coming from the North Entrance, begin your hike at Jenkins Gap, situated roughly 12 miles down Skyline Drive. The parking area is situated on the west side of the road, just before a clearing in the woods and Jenkins Gap Overlook (where there is a separate parking area). 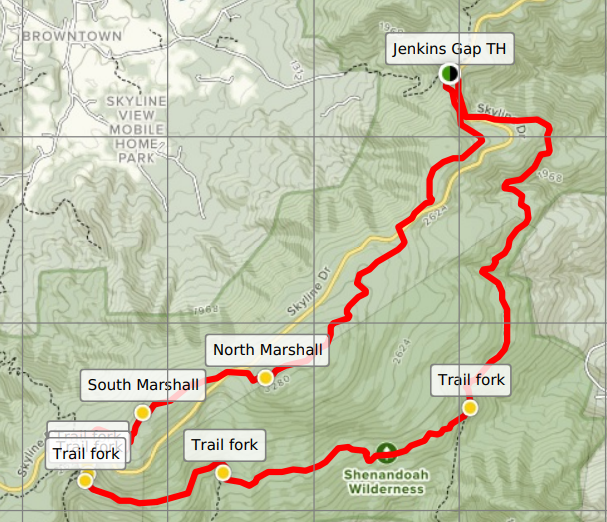 The trailhead at Jenkins Gap provides access to two paths, including the north-south Appalachian Trail (AT) and east-west Jenkins Gap Trail. The former will be your route up and down Mount Marshall. From the parking lot, follow the AT’s iconic white blazes, and bear left at the first turn, encountered after about 50 yards. Climbing from a starting elevation at around 2,400 feet, the AT bears south and begins to ascend a modest incline. Not yet putting Skyline Drive out of earshot, the trail levels off at around 1/3 mile and hugs the east side of the mountain. After cutting right and bearing southwest, hikers encounter pockets of sun at around the ¾-mile mark. The climb eases again in the next quarter mile and then starts to decline to Hogwallow Flat, where the Blue Ridge briefly widens amid a sea of trees. Dropping again, the AT proceeds to cross Skyline Drive at 1.7 miles. There is no sign marking the trail continuation, but the clearing through the woods is apparent. From here hikers begin the gradual ascent to North Marshall (3,368’). Interrupted by only a brief level section, the climb continues for nearly 1 ½ miles. At 3.25 miles, hikers reach the summit and high point of the hike, although views remain obscured. Amid rock outcrops to the right and left, the AT descends after spending what seems like a long time at roughly the same elevation. Rest assured, the magnificent viewpoint on the west flank of North Marshall finally arrives at about 3.5 miles. 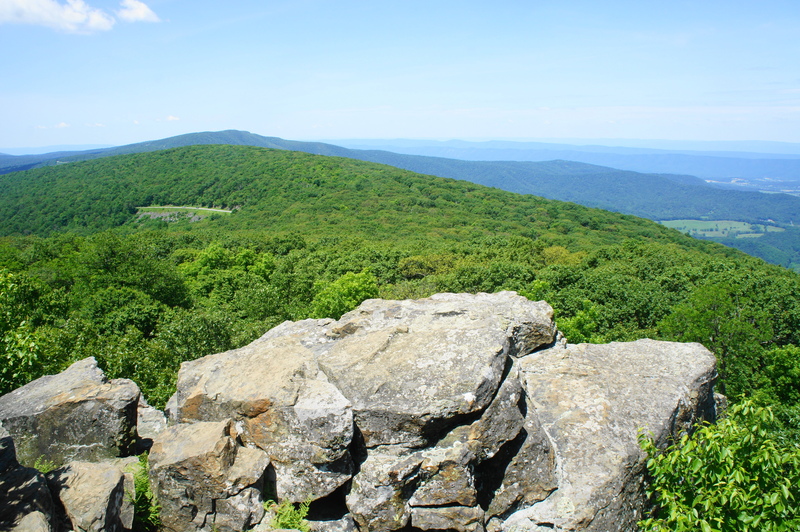 Perched on a rocky ledge, the overlook offers splendid vistas across the Blue Ridge to the west and south, with the Browntown area and Page Valley to the north. 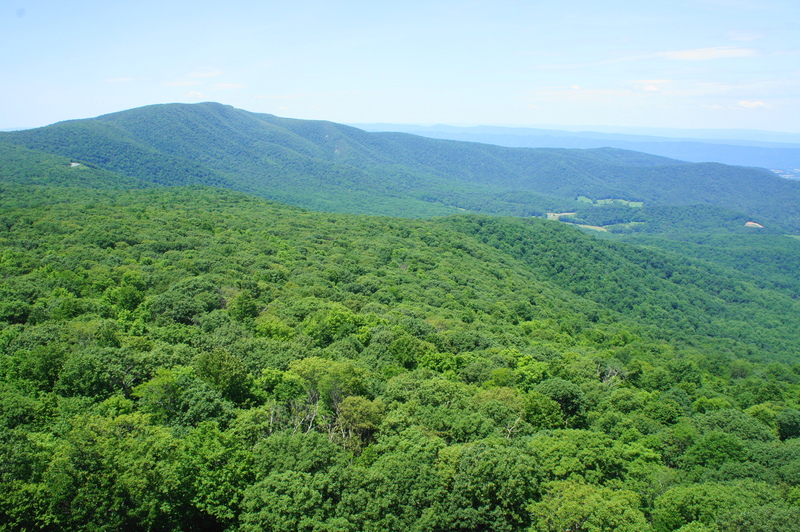 The shorter hill straight ahead, just across a visible stretch of Skyline Drive, is South Marshall (3,212’), with the higher Hogback Mountain (3,474’) beyond. In the distance to the southwest lies Stony Man Mountain (4,011’) and the peaks and ridges of the Central District. 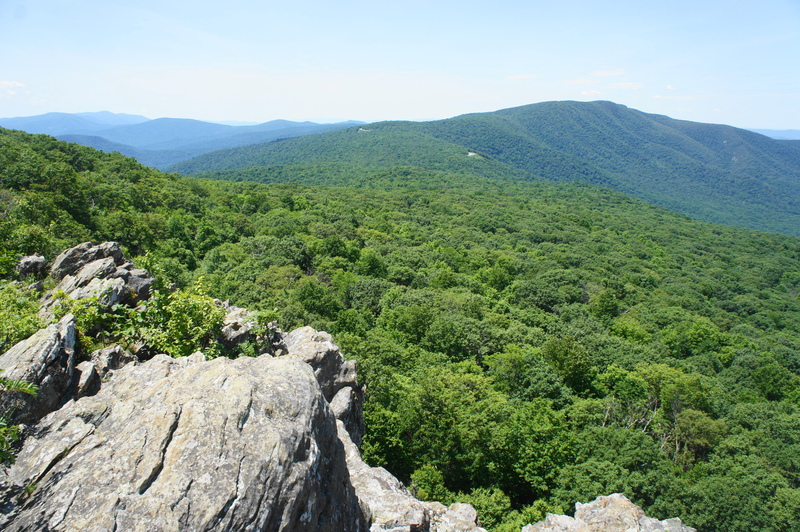 Across Page Valley to the north is Massanutten Mountain, which culminates in an abrupt end at Signal Knob (2,106’). Leaving the viewpoint behind, the Appalachian Trail proceeds down a set of switchbacks, passing a short social trail leading to the base of a towering crag at 3.6 miles. From here it is a short and relatively steep descent to small parking area along Skyline Drive. Stay left and traverse the road at around 3.9 miles. The climb to South Marshall begins shortly thereafter, again rather gradual. Levelling off after just a quarter mile, the first views come into play on the right. At 4.6 miles, follow a short spur to the main overlook on South Marshall, where visitors can enjoy another terrific panorama. Hogback Mountain appears considerably closer from this vantage point, and one can make out Skyline Drive snaking its way west toward Hogback and the Mathews Arm Campground. 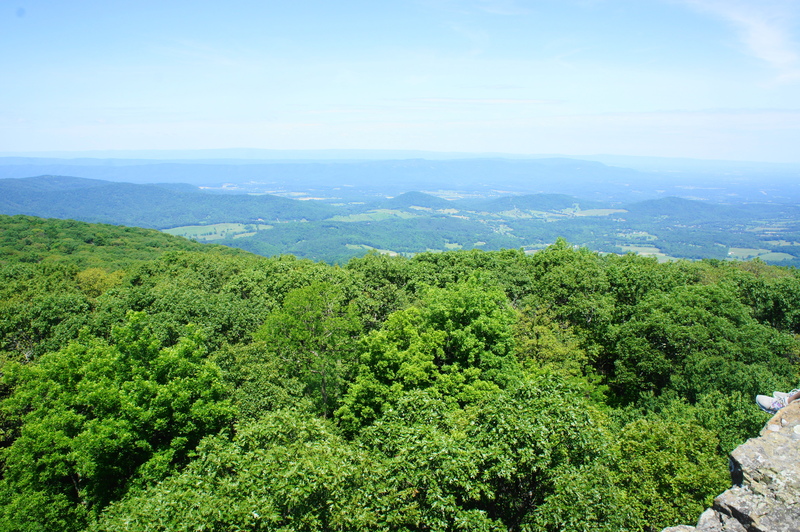 The frame is bounded to the north by Dickey Ridge, with the faint outline of Great North Mountain across the vast valley beyond. The stony perches at the viewpoint make for a fine place to stop for lunch, as you will likely by now be around 2-3 hours into the hike. The loop is only around one-third finished, however. Onward hikers will drop down the western slopes of South Marshall to Gravel Springs Gap (2,666’), where trekkers will leave the AT behind. Cross Skyline Drive again and traverse the small parking area (the start for hikes to Big Devils Stairs) to a gravel service road. After a few dozen yards down the road, the path becomes overgrown and descends the south slopes of the mountain. As the double-track bears sharply right toward Gravel Springs Hut, look for a footpath heading off into the woods to the left. This is the start of the Bluff Trail. Follow the narrow path to another junction at about 5.8 miles. Stay left at the fork, then do so again at a third junction minutes later. 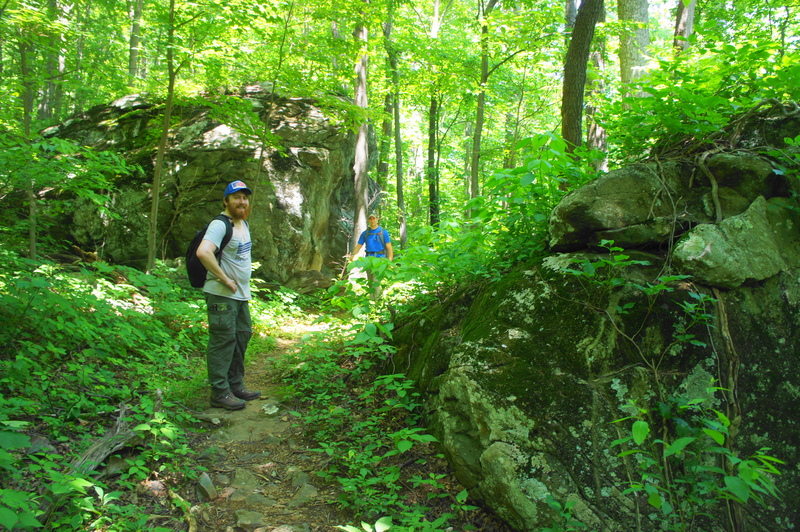 Beyond the web of interlocking trails at Gravel Springs Gap, the Bluff Trail continues uninterrupted for roughly 7 miles. The path generally charts a course along the shady eastern slopes of Mount Marshall. At 6.1 miles, the trail begins a short up-and-down before settling on a gradual upward incline. After leveling out again, hikers will cross the creek that carved Big Devils Stairs downstream at 7.2 miles. Minutes later, the trail forks, with the path to the “stairs” bearing right while the Bluff Trail continues left. At 9.75 miles, the Bluff Trail traverses a lovely stream, followed immediately by a smaller meander. The descent continues and follows the contours of the old Mount Marshall Road as the path bears north. At about 10.6 miles, the trail ascends through mountain laurel and then clears a ravine carved by the Sprucepine Branch of Bearwallow Creek. After a short climb, a very pleasant flat section follows. 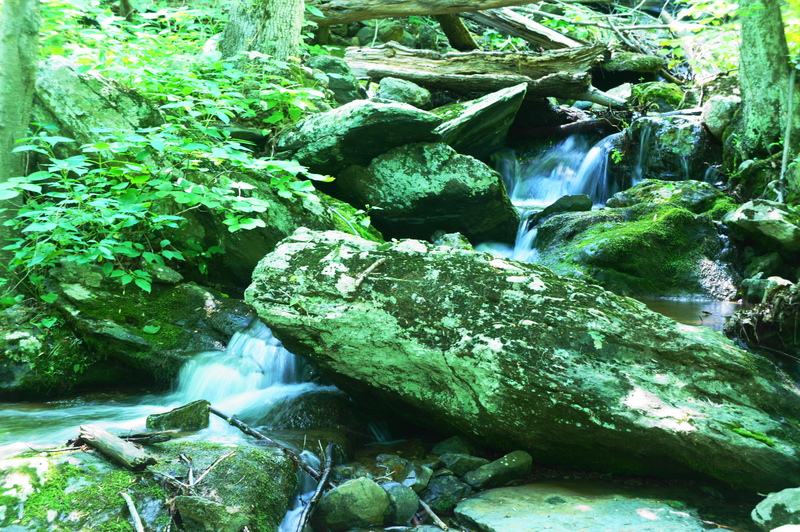 Rounding another, larger gully, the Bluff Trail crosses the Waterfall Branch of Bearwallow Creek at 11.75 miles. From here the trail must gain 300 feet to return to the trailhead but again does so gradually. The footpath finally emerges back at Skyline Drive at 13.1 miles, marking the end of the Bluff Trail, a welcome sign for those with weary legs. To return to the trailhead, cross to the other side of the road and carefully follow the northbound drive as it winds back to Jenkins Gap at 13.5 miles. The Mount Marshall-Bluff Trail loop is not a particularly arduous day hike, considered only to be strenuous because of its considerable length. Hikers should plan to spend most of a day hiking, so bring plenty of water. 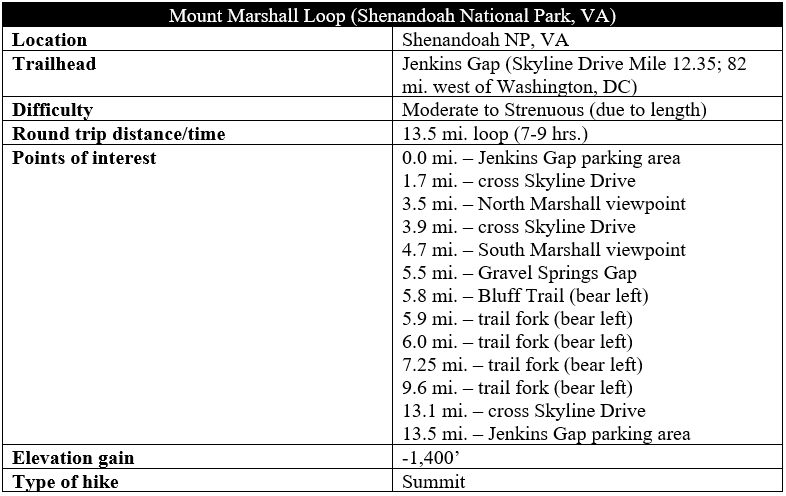 This entry was posted in Moderate Hikes, Shenandoah National Park, Strenuous Hikes, Virginia and tagged Appalachian Trail, Bluff Trail, Gravel Springs Gap, Hogwallow Flat, Jenkins Gap, loop hike, Mount Marshall, Mount Marshall Loop, North Marshall, Shenandoah, Shenandoah Valley, South Marshall, Virginia. Bookmark the permalink.